Successful interior decorating is the coordination of artistic vision with a thorough knowledge of resources and details that make them work. Interior decorating at its best appears simple, yet has depth in quality, personal character and detail. Careful interior decorating prevents costly errors and becomes a satisfying long-range investment. Selecting the right colours, mixing the right textures, and obtaining the right furnishings can be a daunting and time consuming process. We can help you make these important decisions. We place great emphasis on personal service and communication to ensure that the scheme is to your taste and budget. We offer a high quality and complete interior design service, creating individual and imaginative interiors. Whether you would like your whole house transformed or you have one room to change, the goal is to make you feel better about the space you live in. Click on the above image for full article (pdf, 850k). 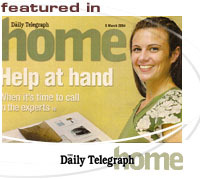 Jodie pictured on cover of Daily Telegraph Home Magazine, March 6, 2004.